"Mobile DJ Hire & Disco Hire For Parties & Events"
Mobile DJ hire mobile disco hire and pa hire for parties wedding DJs party DJs corporate DJs and kids' discos. 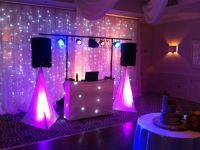 Book a DJ or hire DJs for parties events and special occasions professional DJ hire and disco hire service. Our PA hire sound system can be set up anywhere you may choose to hold your event including wedding venues, manor houses, stately homes, halls, clubs, pubs, outdoor events and anywhere else you may be planning to hold your event. We specialise in birthday parties, sweet 16s, 18ths, 21sts, school discos, house parties, office parties, kids parties, christenings, engagement parties, weddings, anniversaries, awards nights, charity fundraisers plus more. All our DJs are of the highest professional standards and most come from a professional radio station or club background so have years of musical expertise. When it comes down to music we play a full range anything from 60s 70s 80 90s rock & roll, cheese, latest pop and chart music, deep tech house, funky house, garage, drum & bass, dubstep, hip hop, rnb, afro beats, soul & funk, rare groove, reggae, bashment, dancehall, calypso, slow jams plus anything else you wanna throw at our DJs. We also take request on the night or you can send in your playlist before the event. If you would like to book a DJ please contact Adam thanks. Required by many venues, Sound Of Music Mobile Disco has not provided satisfactory evidence of having current PLI available. Also required by many venues, Sound Of Music Mobile Disco has not provided satisfactory evidence of having current PAT records available. Why do people choose to book Sound Of Music Mobile Disco? "Adam turned up on time and was set up in no time. He played great music including lots of tunes from my playlist. Got us all dancing and we had a great time. Would highly recommend. " "Hi thanks for the feedback was my pleasure to DJ at your event glad you would recommend us to future customers. " You may contact Sound Of Music Mobile Disco directly using this form. Alternatively, you can request quotes using this link. If you are contacting Sound Of Music Mobile Disco about an event, it's always a good idea to include the DATE, LOCATION, EVENT TYPE, AGE GROUP and TIMINGS to speed things up!